Periodically checking to make sure your car has enough motor oil is the best way to keep your engine running well for a long time to come. Motor oil is the lubricant between the moving engine parts; if the level is too low, the parts will wear quickly and increase likelihood of engine seizure. Learn how to check your oil to keep this from happening. Make sure the engine isn’t hot. You can burn yourself if you handle engine parts right after you turn off your car. Wait at least 10 minutes or plan to check your oil while the engine is cold. A cool engine ensures that the oil enough time to settle at the bottom of the oil pan and will give you a more accurate reading of how much oil is in the car. Open the hood. Most cars have an interior hood-popping lever located under the steering column. Pull the lever, then walk to the front of your car and unlatch the hood. Raise the hood so that it is completely open, and prop it up with a metal prop if your car has one. In a small number of cars (such as the Mini Cooper) the hood release on the passenger side. Make sure the vehicle is on a flat and level surface or the dipstick will provide an inaccurate reading. This is done best at a gas station where the surface is flat and even. Pull out the dipstick and wipe it off with a clean rag. 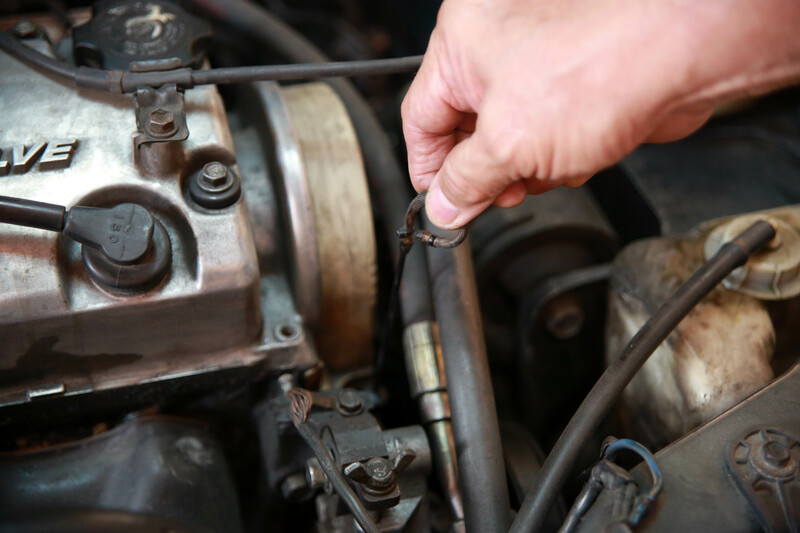 The dipstick is connected to the oil tank in your engine, and is used to determine how much oil is still in the oil tank. When the car is in motion the oil splashes around and covers the entire stick. To check your oil level you need to start with a clean stick. The dipstick is often located near the front of the engine. When you locate it, give it a tug; it should pull out smoothly. Take care not to pull out the transmission fluid dipstick. If you’re not sure which dipstick is connected to the oil tank, check the user manual that came with your car, or ask a gas station attendant for help. Reinsert the dipstick. Carefully place the dipstick back into the pipe connected to the oil tank. Push it all the way down until it is completely reinserted. If it gets rattled or caught along the way, pull it back out, wipe it off, and try again. Remove the dipstick a second time to gauge the oil level. Look at the end of the dipstick to see where the oil’s film ends. The end of the stick will have the word “ADD” toward the end, and “FULL” toward the middle. If the oil film reaches up to or below the ADD line, it’s time to add more oil. If the oil film is close to the FULL line, you don’t have to add more oil quite yet. Determine whether the oil needs to be changed. In addition to checking the quantity of the oil, you should also check the quality. The oil should look clean and smooth. If the oil looks like it contains debris or looks cloudy, it needs to be changed. Find out what kind of oil to use. Oil comes in different “weights,” and different cars require different weights. Check your car’s user manual to figure out what kind of oil you need to use, then buy a quart of it from a gas station or convenience store. Unscrew the oil cap. You don’t pour oil down the same pip where the dipstick is located; instead, unscrew the cap located a few inches away. Pour in the oil. If your oil was very low, pour in the entire quart. You can use a funnel if you wish, or just pour it directly from the bottle into the tank. Check the oil again. Go ahead and pull out the dipstick, wipe it with a rag, reinsert it, and check the oil level to make sure the car now has enough oil. It should now come up to the FULL line. Replace the cap and close the hood. Screw the cap back on tightly, lower the hood and make sure it is firmly closed before starting your engine. Know how often to change your oil. How often you need to change your oil depends on the type of car you own. Some cars need an oil change every 3,000 miles (4,800 km), while others can go up to 10,000 or even 15,000 miles (24,000 km) without an oil change. Research your car and talk to the manufacturer or your mechanic to determine how often your oil should be changed. Change your own oil. Changing your car’s oil can save you between $25 and $75 dollars. If you don’t have an aptitude for working on cars, there’s no reason why you can’t do it yourself. Make sure you have the right oil and tools before you begin. Hire someone to change your oil. Most people take their car to a garage to have the oil changed. Simply drive up to an “oil and lube” facility and let the mechanic there know that your oil needs to be changed. The service usually takes about half an hour and is done by a mechanic while you wait in the lobby. How do I know when it’s time to change engine oil? I need a scientific answer. For standard oil, 3,000 miles is a good rule, 5,000 miles at the most. For synthetic oils, 10,000 miles is the rule, 12,000 miles at most. Factors such as the smell of the oil, the color, and consistency are good indicators. You may be able to tell when the oil is breaking down. Is it normal for the oil to look black? No, you should get the oil changed if it is black. Sears changed my oil to premium oil which cost $39.99. Does this mean it was synthetic oil? If it is, can I mix it with regular oil? Synthetic oil is always higher quality than regular. I don’t think most car centers would call regular oil “premium”, so it is probably synthetic. They should be able to tell you directly. Mixing synthetic and regular oil isn’t the best idea. It will work in an emergency if that’s all you have, but you don’t want to run you car too long on a mixture. The two oils will probably have different characteristics and the synthetic will probably lose performance sooner than it should. If your oil light illuminates on the dash, this is a sign that your engine has dangerously low levels of oil. Refill immediately. Ideally get the oil level around halfway between “Min” and “Max” — less will increase the frequency you will need to top up. Forgetting can be expensive. If you have to top up frequently this is an indication of oil consumption. It may be leaking, or it may be burning inside the engine. Get this checked out by a mechanic. If your oil light illuminates on the dash, this is a sign that your engine has dangerously low levels of oil. In most cases, the oil light is for oil pressure. If the oil light starts to flicker or comes on it’s an indication of low oil pressure. This can be due to low oil or a failing oil pump. Refill immediately.